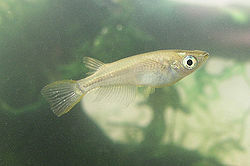 Medaka are very small fish that is smaller than 4cm, and the name comes from the big eye that protrudes from the top of the head. The scientific name is “Oryzias latipes”, and the color is brownish gray in wild types, while mutated types are many color likes black, yellow, and white and so on. Medaka are classified into wild types and mutated types; what’s more wild types are classified by distribution. There are any groups, For example, north Japan group and south Japan group, then Korean group and Chinese group. On the other hand mutated types also be classified five types, “HIMEDAKA”, ”SHIROMEDAKA”, ”AOMEDAKA”, “ALBINO”, and “TOUMEIMEDAKA”, these refer to four pigments: black, yellow, white and iridescence. Medaka range over all parts of the country and their habitat is streams or canals. Medaka feed on animal plankton, and spawn from spring to summer. they spawn ten eggs at one time; Fry grow up between summer and fall. The population has been decreased year after year because of deterioration of environment through use of agricultural chemicals or life drainage and decreasing of streams by bank protection or maintenance of canals. Therefore Medaka are designated as an endangered species. If you want to see Medaka in Kochi you should go to “Medaka Fureai Park” in Nankoku city. I see that medaka has many species and decreacing. I want to go to Medaka Fureai Park. Medaka is very pretty. I had i t when I was a child. I heard “Medaka Fureai Park” for the first time. I have medak before a few days. They are very cute. When it was a child, Japanese variety of cyprinodont was often captured. I want to maintain a beautiful river where Japanese variety of cyprinodont can live. I don’t see Medaka recently. Maybe they decrease in habitat.I want to protection their. I don’t see Medaka recently. I want to go to “Medaka Fureai Park”. I have Medaka in my house. I know Medaka are designated as an endangered species,so I important my Medaka. I am sad because Medaka’s population has been decreased. I think that a problem of environment is serious. So, we need to consider a problem of environment. I don’t know that Medaka has been decreased . Before come in Kochi university, I breeded Medaka, but I don’t know there are any groups such as north Japan group and south Japan group.